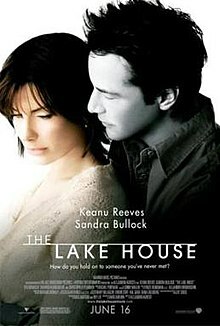 The Lake House is a 2006 American romantic drama film directed by Alejandro Agresti and starring Keanu Reeves, Sandra Bullock and Christopher Plummer. It was written by David Auburn. The film is a remake of the South Korean motion picture Il Mare (2000). The story centers on an architect living in 2004 and a doctor living in 2006. The two meet via letters left in a mailbox at the lake house they have both lived in at separate points in time; they carry on correspondence over two years, remaining separated by their original difference of two years. This film reunites Reeves and Bullock for the first time since they co-starred in Speed in 1994. In 2006, Dr. Kate Forrester (Sandra Bullock) is leaving a lake house that she has been renting in Madison, Wisconsin to move to Chicago. Kate leaves a note in the mailbox for the next tenant to forward her mail, adding that the paint-embedded pawprints on the path leading to the house were already there when she arrived. Two years earlier in 2004, Alex Wyler (Reeves), an architect, arrives at the lake house and finds Kate's letter in the mailbox. The house is neglected, with no sign of paw prints anywhere. During the subsequent restoration of the house, a dog runs through Alex's paint and leaves fresh paw prints right where Kate said they would be. Baffled, Alex writes back, asking how Kate knew about the paw prints since the house was unoccupied until he arrived. On Valentine's Day 2006, Kate witnesses a traffic accident near Daley Plaza and tries to save the male victim, unsuccessfully. She impulsively drives back to the lake house, finds Alex's letter and writes back. Both Alex and Kate continue passing messages to each other via the mailbox, and each watches its flag go up and down as the message leaves and the reply arrives as they wait at the mailbox. They cautiously look around each time the flag changes, hoping to somehow spot the other. It is in vain as they are alone at the mailbox. They then discover that they are living exactly two years apart. Their correspondence takes them through several events, including Alex finding a book, Jane Austen's Persuasion, at a railway station where Kate said she would have lost it, and Alex taking Kate on a walking tour of his favorite places in Chicago via an annotated map that he leaves in the mailbox. Alex eventually meets Kate at her boyfriend's party but he doesn't mention their exchange of letters to her because she did not "know" him at that time. She later remembered the meeting as a vague memory in the past. For Alex, the meeting happened in the present but for Kate, it had already taken place in the past without her knowing that it was Alex. As Alex and Kate continue to write each other, they decide to try to meet again. Alex makes a reservation at the Il Mare restaurant for March 2007 — two years into Alex's future, but only a day away for Kate. Kate goes to the restaurant but Alex fails to show. Heartbroken, Kate asks Alex not to write her again, recounting the accident a year before. Both Alex and Kate leave the lake house, continuing on with their separate lives. On Valentine's Day 2006 for Alex, Valentine's Day 2008 for Kate, he returns to the lake house after something about the day triggers a memory. Meanwhile, Kate goes to an architect to review the renovation plans for a house she wants to buy. A drawing of the lake house on the conference room wall catches her attention and upon asking, Henry Wyler informs her the artist was his brother, Alex, and Kate realizes that this was the same Alex with whom she had been corresponding. She also learns that Alex was killed in a traffic accident exactly two years ago to the day and realizes why he never showed up for their date - he was the man who died in Daley Plaza. Rushing to the lake house, Kate frantically writes a letter telling Alex she loves him, but begs him not to try to find her if he loves her back. Wait two years, she says, and come to the lake house instead. Meanwhile, Alex has gone to Daley Plaza to look for Kate. At the lake house, Kate drops to her knees sobbing, fearing that she has arrived too late to stop Alex. After a long pause, the mailbox flag finally lowers; Alex has picked up her note. Not long afterwards, a familiar mint-green truck pulls up. She walks forward smiling as the driver, clad in jeans and a familiar tan jacket, approaches. She and Alex kiss and walk toward the lake house. The film is set and filmed in the Chicago area. The lake house itself was built on what is called Maple Lake, located within the Maple Lake Forest Preserve off of 95th Street in the southwest suburbs of Chicago. After filming the house was removed and a simple fishing dock was put in its place. The downtown scenes are in The Loop. The scenes where Kate and Morgan go to Henry's office, and Kate's dramatic exit down the stairs, were filmed at the Chicago Architecture Foundation. The scene where Henry and Alex talk on the street after being in their father's office was filmed on the 400 block of South Michigan Ave, in front of the Fine Arts Building and the Auditorium Theater. The scene where Alex and Simon converse in Simon's home was filmed at the Prairie Avenue Bookshop, an architectural bookstore in Chicago which closed in 2009. Other filming locations include Aurora, Illinois (now the Madison Park community) and Riverside, Illinois, a small town on the outskirts of Chicago that is known for its historic houses, and several Frank Lloyd Wright buildings. The railway station in the movie is the real station of Riverside, and the bridge that Alex crosses while chasing Jack is called the "Swinging Bridge"; it crosses the Des Plaines River. The scene where Kate gets stood-up is in Millennium Park at the Park Grill. The bar scene in the Loop where Kate is seen sitting on the barstool, speaking with the woman at the wooden bar, is the real "Millers Pub" located at 134 S Wabash Ave, Chicago, IL 60603. The Lake House: Original Motion Picture Soundtrack was released in 2006. The film trailer also features the song "Somewhere Only We Know" by the band Keane. It is available on the album Hopes and Fears. In its opening weekend, the film grossed a total of $13.6 million, ranking fourth in the United States box office. As of October 1, 2006, the movie has grossed $52,330,111 domestically, and $114,830,111 worldwide. On September 26, 2006, the movie became the first to be simultaneously released on DVD, Blu-ray Disc and HD DVD (courtesy of Warner Home Video). According to the website Rotten Tomatoes, 35% of the critics gave the movie a positive review, resulting in an aggregated rating of "rotten". USA Today critic Claudia Puig wrote, "The Lake House is one of the more befuddling movies of recent years. The premise makes no sense, no matter how you turn it around in your head." Roger Ebert, while pointing out the movie's logical inconsistencies, wrote, "Never mind, I tell you, never mind!" Ebert gave a positive review (3.5 stars out of 4) noting, "What I respond to in the movie is its fundamental romantic impulse." On August 18, 2006, Reeves and Bullock won a Teen Choice Award for "Choice Liplock" for The Lake House. Price, Prof. H.: "Time's Arrow and Archimedes' Point", 1997 Oxford University Press, USA. Home page of the widely acclaimed book. Huw Price is Professor of Philosophy at the University of Sydney, Australia. Retrieved on 2008-09-26. Avery, Samuel C.: "The Dimensional Structure of Consciousness: A Physical Basis for Immaterialism", 1995 Compari. Retrieved on 2008-09-26.